The SatStation Iridium Battery Charging Station charges phone batteries outside the Iridium 9555 handset. This charging accessory can be very handy in situations when extra batteries must always be available for continuous, mission-critical operations of satellite phones. Capable of conditioning and rapid charging Iridium batteries in a single process without ever draining the battery. Charge at current rates recommended by the battery manufacturer. Be suitable to operate at the office (AC) as well as in vehicles and boats (DC, optional). Maintenance mode is available once the battery is fully charged. In the maintenance mode the battery is kept at peak condition for as long as it is left on the unit, without ever overcharging or overheating. Dimensions: 6 x 3.75 x 1.25 in. 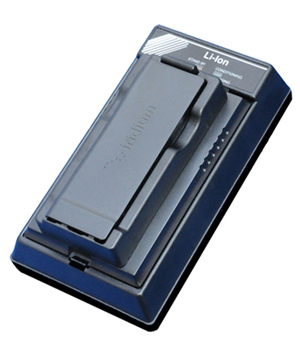 NOTE: The Iridium stand alone battery charger is available in single-bay and four-bay versions. Vehicular mounting kits and DC chargers are available as options.